I have two little kids who love to read books, so writing a board book for children was a very natural extension of my everyday life. It was so fun to be able to have a little test audience in my own home while writing Who Sang the First Song?. I came up with idea for the book because Emmylou actually asked me one day in passing, “Mom, who sang the first song?” I love that kids are ALWAYS asking questions, and I love how my kids’ questions often make me slow down and think about things that I normally wouldn’t. So instead of answering my daughter right away, I decided to do some research and write a book! 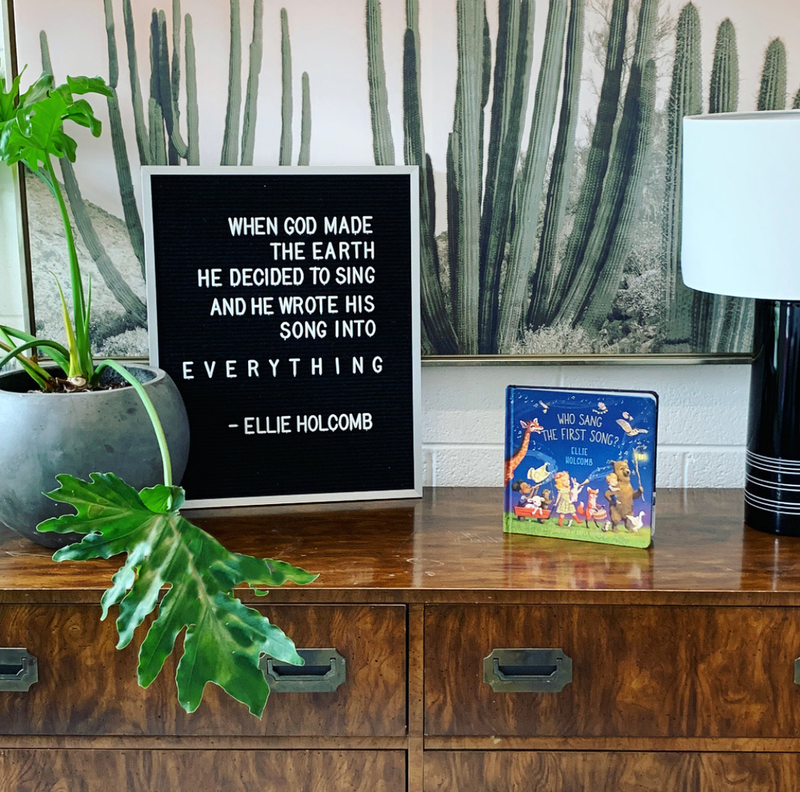 I’ve always loved that image she gives of God singing creation into being, and it felt like a clue to my daughter’s question, so I went on a treasure hunt of sorts looking for the answer. Sally happens to be a sweet friend of mine, so I met up with her when she was in town to pick her brain on the idea that she presented in her book. She was kind enough to point me to a sermon on Genesis 1 by Tim Keller, who is one of my very favorite teachers. In this sermon, Keller talks about how we often get caught up in the “how” of Creation, but he was more curious about “why” God decided to create the world and all of us. He explains that the first chapter of Genesis is written in the form of an archaic Hebrew poem, so there was a cadence and a rhythm to the way that God spoke the world into being. It feels very close to a song, and Keller suggests that perhaps God sang the world into being so that the world itself could sing of the goodness, power , and love of its’ Creator! But Keller doesn’t stop there. He explains that while God’s song says we are good and wonderfully made, and while He fully intends for us to sing that song, we know that something is off and broken in this world and in our own hearts. He asks where else in the Bible we see the words “In the beginning,” other than Genesis 1, and points us to chapter 1 of John: “In the beginning was the word, and the word was with God and the word was God.” So it is through the work of the Living Word, Jesus Christ Himself, who died on a cross and rose again, that we can be restored to the whole versions of ourselves and sing the song of love and beauty that God created us all to sing. I was captivated and deeply encouraged by this insight, and I’m so grateful that this message is woven throughout the pages of Who Sang the First Song? Who Sang The First Song? available now.